For more information about Virtualization and its configuration, refer to the Virtualization main article. To verify that information is being properly synchronized, you may use the option presented in the Entities module to run an initial import (as a checkpoint while configuring Virtualization in the Development Environment). In addition to this, if you have used Virtualization for a set of Entities which are related (have foreign keys and relationships between them), you may also want to review that the relations are set properly. For more information on this, please review the example at How to configure Virtualization for related entities. This option will allow you to synchronize the values for your Master Entities set in Virtualization. It applies to the Development Environment. 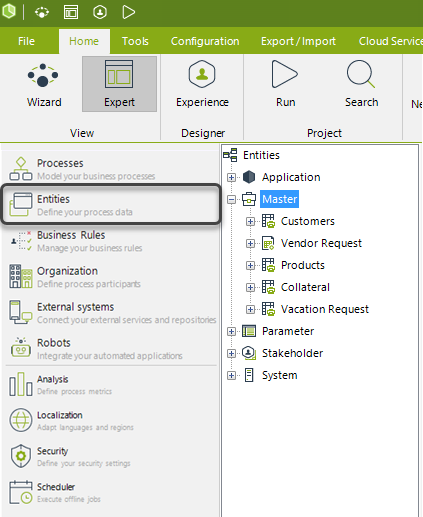 To use it, go to the Entities module and locate the given Master Entities (Customers in our example) under the Master classification. You may want to Refresh this view in case you were already standing in this option. 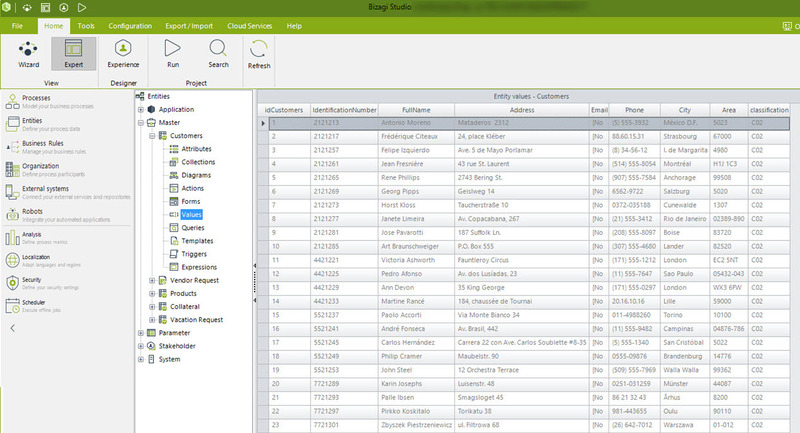 Under the created Master Entities, you may click Values to query their records. Bizagi's work area will show the synchronized values. How to access virtual Entities information in Processes? Once Virtualization is properly set and tested in your project, your Bizagi Processes will be able to both obtain and update information from virtual entities on-demand (through the connection to your external data source). This is done transparently for both: The end users (while working in the Work Portal), and for the Bizagi Studio users implementing the Bizagi Solution. 1. In the Processes execution (run-time) whenever a new record is added, or an existing one is searched for in the virtual entities, Bizagi will query this information in the data source and update the information when necessary. 2. 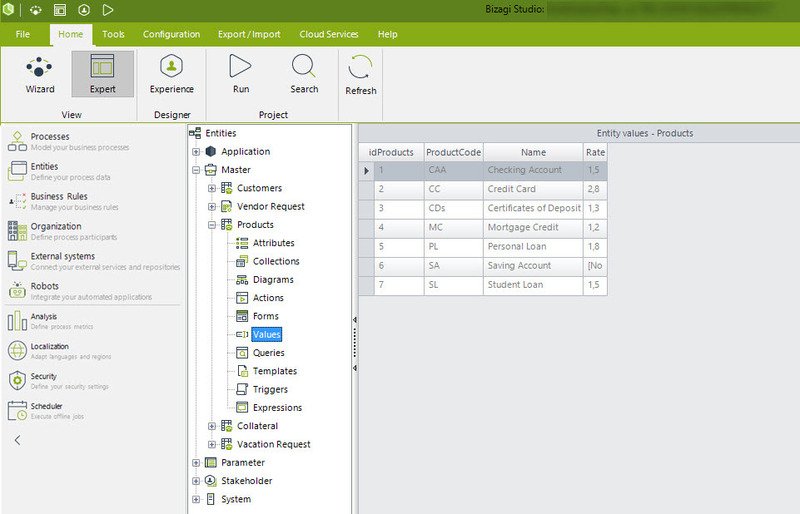 In the Development environment (Bizagi Studio), users do not need to worry about where the information is coming from. User interfaces (forms), business rules, and in general, all objects in Bizagi, will be designed as if these entities were at the local database (at Bizagi's data model). No additional considerations are required. In order to search for existing records, you may use either: the Suggest or Search controls inside your forms (to allow end users look for certain records), or Bizagi CEntityManager methods inside business rules (to allow the system perform a search). Both options will be handled automatically by Bizagi to look for the queried records at the proper source. For more information about the Search and Suggest controls, refer to User interfaces Controls. For more information about accessing information of virtual Entities from business rules, refer to Access entities not related to the data model.